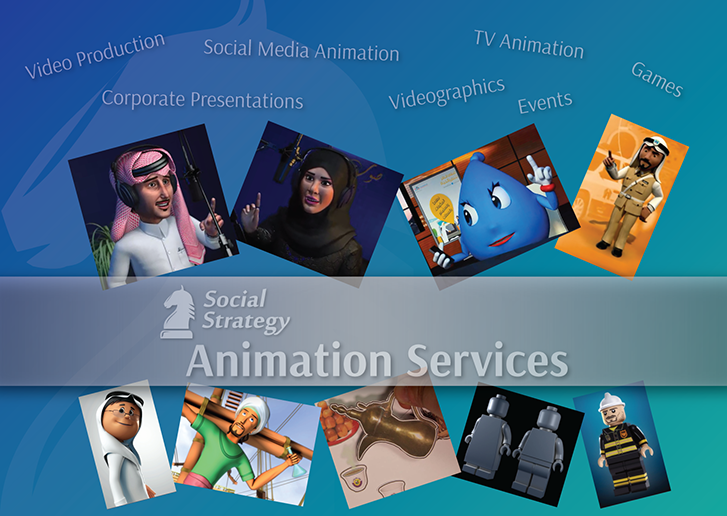 Introducing Social Strategy’s Animation Services – Social Strategy Ltd.
We are excited to announce that Social Strategy Ltd. is introducing a new service to the market that many are requesting yet very few companies are delivering professionally. Today and with the explosion of social media usage, there are many different scenarios animation can be used to enforce your brand in a crowded marketplace. What makes animation especially compelling is the mixture of simplifying complex concepts in a story-like and entertaining way. Producing a professional animation production takes a lot of dedicated efforts and organized approach. Communication is vital. Our team works with you on every step to ensure that the final delivery meets your expectations. It all starts with a compelling idea. From there, the scenario script is written, then the storyboard, narration is prepared, the layout is next whether it is 2D or 3D work. The process continues hence preparing all objects and rendering the animation and finally adding music and sound effects to produce the final production. Our team can work according to your requirements to produce the suitable type of animation (2D, 3D, etc. ), however, we have exciting packages aimed at social media promotions at very competitive pricing. We have produced very well-perceived stop-motion animation projects like this one: https://youtu.be/BgygKRWsw24 and this one for one of our clients on mother’s day: https://youtu.be/It2-PXPMMgo. Contact us for details on the packages. Do you have a thrilling project idea that needs the world to see it? Our team will be happy to discuss with you how we can translate it into an animated production. Reach us by e-mail: info@social-strategy.co or by phone: (+974) 44023023 or Mobile: (+974) 55553548. Call us now.